Whenever I visit a new place, I try to pay attention to the symbols that are everywhere. I know squat about architecture, but I pretend to know what symbols mean. My knowledge is mostly based on Dan Brown's teachings and my own rudimentary investigation, which is somewhat lame when compared to his characters. Oh well, you get your knowledge where you get your knowledge. 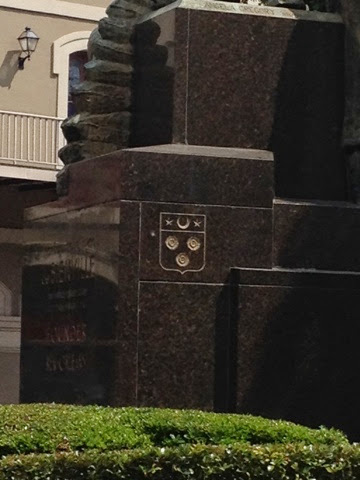 New Orleans has an overwhelming amount of symbols that I am looking forward to identifying. Exploring the history of the markings will be fun! The Fleur de Lis is everywhere of course because of the city's historic French influence. There are free mason symbols and the heavy, Catholic influence is marked many places. There was one symbol I could not identify and am investigating now. My first guess was that it was the symbol of the Crescent City, but there is another crescent with falling stars that seems to represent New Orleans. The crescent moon is frequently used to represent religion in various forms, this one I just can't seem to identify. Any other guesses? I'll find it eventually if none of you know what this is. 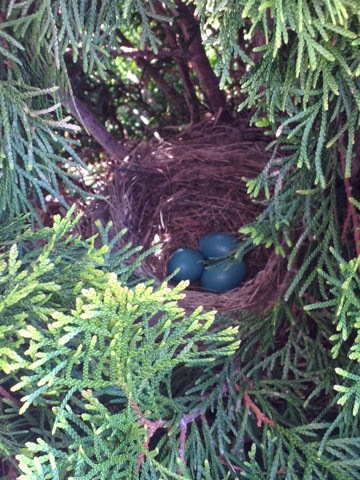 Then I returned home and found the symbols of spring marking my front tree. Paying attention to the signals of new life are precious cues into your own. My Grandfather used to say that you get a choice each and every day to decide what kind of day you're going to have. (Thanks Stepp aunties for passing that one on to me). Stress happens and moving is one of the induced stress list toppers. How you choose to handle that stress is the key. This move is a little more challenging for me, but my kids' age and awareness may prove to be my biggest challenge. So while I'm paying attention to my surroundings, my mama radar is scanning for my offspring's reactions. We are trying to keep their focus on the here and now, while gently hinting at the future. We had to say farewell to gymnastics this week since my daughter's broken leg halted her training. I watched her frown emerge. This was her first goodbye of many. I didn't try to cheer her too much because her feelings needed to be validated. What I told her was that the sadness she's feeling shows her how much gymnastics means to her. It is an experience that we will revisit when we first step foot into her new gym. There are surely tears to follow in the upcoming months. She will be taught my Grandfather's lesson that she can choose what kind of day she wants to have, even when the situations are not her choice. My son is a bit older and appears excited about this move. He loves to visit new places and soaks it in like a sponge. He'll be sad to leave friends, but being older he'll likely facetime or skype from time to time. He's being watched too though because people carry stress is different ways and I fear that he would hide his from me, trying to appear tough and manly. So as Spring finally shows itself and the countdown shrinks to mere weeks, we become keen observers. The signs of stress and sadness appearing on my kids' faces are a reminder that this move is not just about the logistics. There are roots accidentally planted that need to be gently pulled. They'll be replanted in the embrace of positive parenting. I truly hope that there won't be too much damage and that the symbols of moving will be positively perceived.